Plastic surgery is not a decision that people take lightly. Be it for cosmetic or medical reasons, plastic surgery is a delicate procedure that is used to either restore or create a new appearance. Because of this risk, patients take great care to select a plastic surgeon with the utmost experience. However, when these surgeries go wrong, the results can not only be devastating – but permanent. Victims of botched plastic surgeries often don’t know where to turn after the damage has occurred. Many medical professionals and doctors are trained to curb blame and refer to the situation from a distanced level. 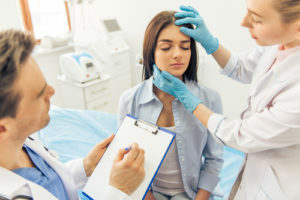 The truth is that plastic surgeons must have experience and must exercise extra care when performing something as delicate as a plastic surgery. Moreover, they must make their patient aware of the potential dangers and outcomes of plastic surgery. When they fail to do so they could be held liable for medical malpractice. A botched plastic surgery could lead to more invasive corrective surgery, missed time at work, lost wages, and an overall difficult financial and physical situation. There’s also the insurance company – especially in cases where the surgery was an elective one, most insurance companies are extremely difficult to deal with. Nobody should have to clean up the mess caused by a negligent party. If you or a loved one has undergone plastic surgery and has suffered injury due to complications, don’t wait. Contact the experienced medical malpractice attorneys at Team Law today at 732-388-5454 to schedule your initial case consultation. ← Will You Need Physical Therapy After an Auto Accident?